Planned Parenthood Federation of America claims that the 665 clinics run by its affiliates provide a “wide range” of health care as justification for taxpayers providing more than 40 percent of their funding, and that abortion is a small proportion of their services. Yet, data show that Planned Parenthood Federation of America is the country’s largest abortion provider with affiliates performing more than 300,000 abortions per year, which amounts to approximately one out of every three in the country. How Does Planned Parenthood Calculate Its Claims About Its Abortion Services? Although Planned Parenthood Federation of America reportedly requires all affiliates to have at least one clinic that performs abortions, Planned Parenthood’s annual report does not identify the number of affiliated clinics that provide abortion services or how much of Planned Parenthood’s total revenue results from abortions. Instead, the report claims that abortions account for only 3 percent of the medical services Planned Parenthood affiliates provide. How does the Planned Parenthood annual report arrive at the 3 percent figure? The calculation counts each “discrete clinical interaction” as a separate “medical service,” meaning simple tests or routine provision of birth control are given the same weight as surgical or chemical abortions. For example, if a woman in the course of a year receives a free condom, a pregnancy test, a sexually transmitted infection (STI) test, and an abortion, Planned Parenthood would say abortion was only 25 percent of the services provided. Planned Parenthood affiliates perform about 20 abortions for every prenatal care visit and about 200 abortions for every adoption referral based on the approximately 300,000 abortions they perform each year. Combined federal, state, and local government funding has increased from $203 million (30 percent of Planned Parenthood’s consolidated revenue) during its fiscal year 2000–2001 to $528 million (41 percent of revenue) during 2013–2014. Planned Parenthood’s annual report does not provide a breakdown of federal versus state funding or the exact government grants, contracts, and reimbursements it receives. A Congressional Budget Office (CBO) analysis released in September 2015, however, shows that the organization’s affiliates received approximately $60 million of taxpayer money under Title X of the Public Health Services Act, and $390 million through federal payments under Medicaid in 2013. The federal government generally provides reimbursement for 90 percent of the cost of “family planning services” and products covered under Medicaid, while states provide the remaining 10 percent. Because Title X grants offer up-front funding to providers (rather than payment after-the-fact, as with Medicaid or private insurance), the program provides essential infrastructure support that allows health centers providing family planning services to keep their doors open for clients. Up-front funding helps supply a cash-flow cushion for providers who are often operating on tight and uncertain budgets. (ii) If requested to provide such information and counseling, provide neutral, factual information and nondirective counseling on each of the options, and referral upon request, except with respect to any option(s) about which the pregnant woman indicates she does not wish to receive such information and counseling. Planned Parenthood affiliates therefore must offer every pregnant woman they serve under a Title X grant the opportunity to receive information about abortion. If any pregnant woman requests an abortion referral, the affiliate must provide such a referral, thereby using tax dollars to help grow or sustain the abortion industry. To ensure that taxpayers are not forced to subsidize America’s number one abortion provider, Congress should make Planned Parenthood affiliates ineligible to receive either Medicaid reimbursements or Title X grants if they continue to perform abortions. Taxpayer money from these programs should instead be redirected to the more than 9,000 federally qualified health center sites throughout the country that provide comprehensive primary health care for those in need without entanglement in abortion. —Jamie Bryan Hall is a Senior Policy Analyst in the Center for Data Analysis, of the Institute for Economic Freedom and Opportunity, at The Heritage Foundation. Roger T. Severino is Director of the DeVos Center for Religion and Civil Society, in the Institute for Family, Community, and Opportunity, at The Heritage Foundation. Alliance Defending Freedom, “Women Have Real Choices,” https://adflegal.blob.core.windows.net/web-content-dev/site-assets/final-national-map-1.png (accessed September 24, 2015). Planned Parenthood Federation of America, “Who We Are,” http://www.plannedparenthood.org/about-us/who-we-are/ (accessed September 24, 2015). Planned Parenthood Federation of America notes that it “has 59 independent local affiliates that operate approximately 700 health centers throughout the United States.” Planned Parenthood Federation of America, “Planned Parenthood at a Glance,” http://www.plannedparenthood.org/about-us/who-we-are/planned-parenthood-at-a-glance (accessed September 24, 2015). Americans United for Life, “The New Leviathan: The Mega-Center Report—How Planned Parenthood has Become Abortion, Inc.,” 2015, http://www.aul.org/wp-content/uploads/2015/06/AUL-Mega-Center-Report-06-24-2015.pdf (accessed September 24, 2015). M. Alex Johnson, “Abortion Mandate Costs Planned Parenthood a Few Affiliates,” NBC News, December 6, 2012, http://usnews.nbcnews.com/_news/2012/12/06/15702142-abortion-mandate-costs-planned-parenthood-a-few-affiliates (accessed September 24, 2015). 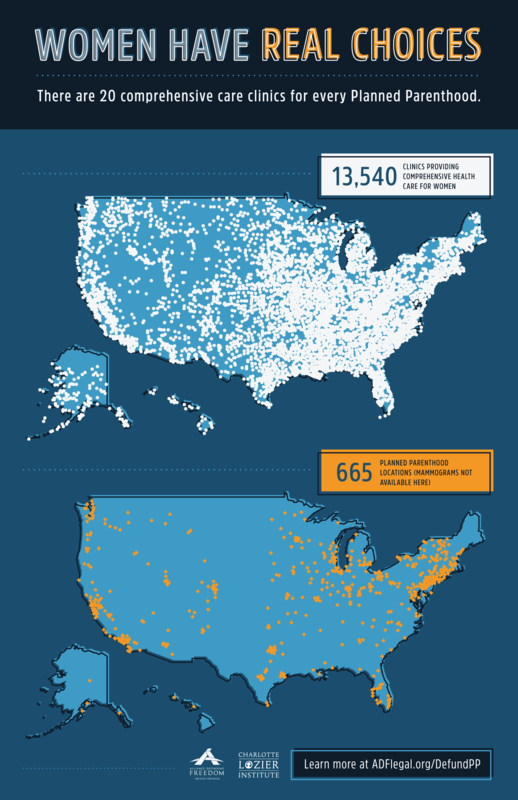 Planned Parenthood, 2013–2014 Annual Report, pp. 17–18, http://issuu.com/actionfund/docs/annual_report_final_proof_12.16.14_/0. Author calculation based on dividing the total number of “abortion procedures,” 327,653, by the number of “patients,” 2.7 million, reported by Planned Parenthood Federation of America in its latest annual report. Ibid. This calculation does not take into account the possibility of some women having had more than one abortion at Planned Parenthood clinics in the same reporting year; the Guttmacher Institute, however, reports that the “average, or mean, time span between abortions reported on the 2002 NSFG [National Survey of Family Growth] was 44 months.” Guttmacher Institute, “Repeat Abortion in the United States,” November 2006, https://www.guttmacher.org/pubs/2006/11/21/or29.pdf (accessed September 24, 2015). Rachel K. Jones and Jenna Jerman, “Abortion Incidence and Service Availability in the United States, 2011,” Perspectives on Sexual and Reproductive Health, Vol. 46, No. 1 (March 2014), Table 1 (reporting 1.31 million abortions in America in 2000 and 1.05 million abortions in 2011, which amounts to almost a 20 percent decline over that time period), http://www.guttmacher.org/pubs/journals/psrh.46e0414.pdf (accessed November 29, 2015). Planned Parenthood reports that its affiliated clinics performed 197,070 abortions in 2000 and 333,964 abortions in 2011. Planned Parenthood, 2000–2001 Annual Report, p. 9, http://www.centerformedicalprogress.org/wp-content/uploads/2015/05/2000_-_2001.pdf (accessed September 29, 2015), and Planned Parenthood, Annual Report 2011–2012, p. 5, http://www.plannedparenthood.org/files/4913/9620/1413/PPFA_AR_2012_121812_vF.pdf (accessed September 29, 2015). Planned Parenthood, 2013–2014 Annual Report, p. 18, http://issuu.com/actionfund/docs/annual_report_final_proof_12.16.14_/0”. Planned Parenthood, 2000–2001 Annual Report, p. 19, and Planned Parenthood, 2013–2014 Annual Report, pp. 20–21. Congressional Budget Office, “Budgetary Effects of Legislation That Would Permanently Prohibit the Availability of Federal Funds to Planned Parenthood,” September 22, 2015, https://www.cbo.gov/publication/50833 (accessed September 29, 2015). 42 U.S. Code § 1396b(a)(5). Other sources of federal money totaling approximately $1 million include Medicare and the Children’s Health Insurance Program. Adam Sonfield, Kinsey Hasstedt, and Rachel Benson Gold, “Moving Forward: Family Planning in the Era of Health Reform,” Guttmacher Institute, p. 13, http://www.guttmacher.org/pubs/family-planning-and-health-reform.pdf (accessed September 24, 2015). 42 CFR 59.5(a)(5), http://www.gpo.gov/fdsys/pkg/CFR-2007-title42-vol1/pdf/CFR-2007-title42-vol1-sec59-5.pdf (accessed September 29, 2015).